Salpointe senior Cam Miller drives past Tempe player toward the basket in game against Tempe high school on Saturday, Feb. 18. The Lancers won 70-48. 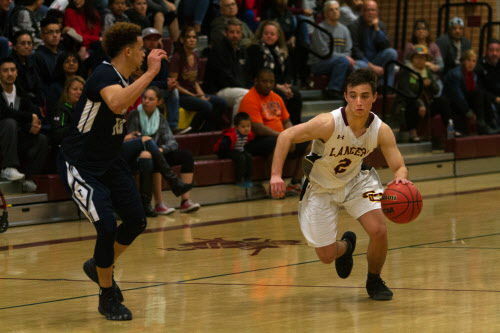 Salpointe Catholic and Catalina Foothills both won their Class 4A state playoffs on Saturday, setting up a semifinal showdown between the two teams. The Lancers and Falcons will play at 5:45 p.m. Thursday at Copper Canyon High School in Tolleson, with the winner advancing to the state championship game. They weren't the only local schools advancing. Sabino and The Gregory School both climbed one run closer to a state championship with wins on Saturday. The full list of scores and schedules (when applicable) are below. Up next: vs. No. 2 Salpointe Catholic at Tolleson Copper Canyon High School, 5:45 p.m. Thursday. Up next: vs. No. 3 Catalina Foothills at Tolleson Copper Canyon High School, 5:45 p.m. Thursday. Big schools go 0 for 6 against tougher competition. The Gregory School's boys, girls win.